Rise of the Triad is easily the most game changing first person shooter today, much like it had the potential to be back when the original was first being developed as a sequel to Wolfenstein 3D. 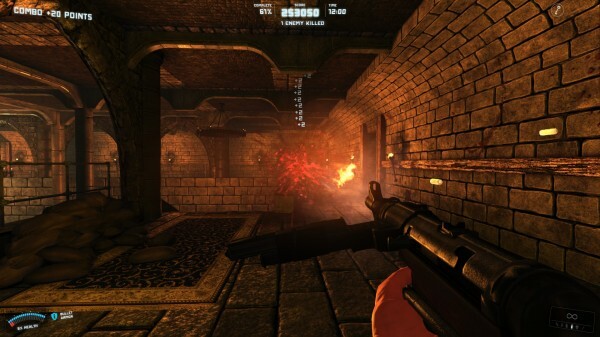 Rise of the Triad is, of course, a remake of the game with the same title from back in 1994. Rise of the Triad has a rather simple story. A group of expert military operatives, called the H.U.N.T, are sent to an island in order to investigate what seems to be a dangerous cult. However, things quickly take a turn for the worst when they are attacked and left stranded on the island. It is up to the player, and their skills, to traverse the games levels, taking down the cult, and leaving the island. What’s interesting about the games story is that the game rarely uses cutscenes to tell the player anything. In fact, outside of the initial cutscene, there are very few within the game, leaving the player to work out what’s going on through observation and supposition. For example, during the first leg of the game, you have the opening cutscene, as well as all of the weird Nazi-tech surrounding you to drive you forward. Whereas, in the second leg, you start to wonder where all this weird Nazi-tech is coming from, why are there bosses with overpowered abilities and just where in the environment can I glean this information? If you look around hard enough, there are a lot of very subtle hints as to what is actually going on with this secret cult. The NME (enemy, get it!) are up to something, and the more you look around, the more you piece together whilst sprinting from area to area, the more you realise it is no good. However, the story is most definitely not a really deep piece about the human experience of killing Nazis with a baseball bat. It’s a story about a team that has to take on Nazis with a baseball bat. And it’s pretty hilarious. 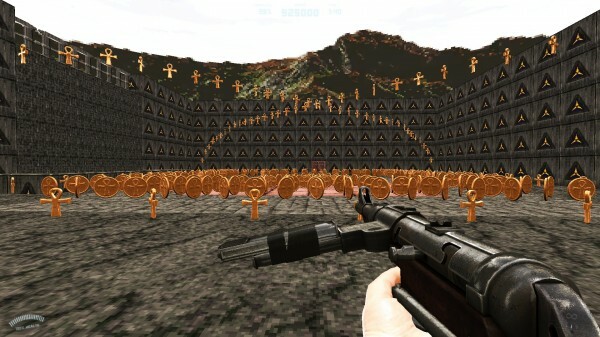 Rise of the Triad is an accurate recreation of the original game in the sense that the levels, weapons and enemies are largely similar to it. The levels are still arcade madness, the weapons are still split into three groups and the enemies still range from common to bizarre. One of the things that makes Rise of the Triad unique in todays gaming climate is that the levels aren’t just simple ‘A to B’ styled levels. Rather, they’re interesting ‘A to B’ style levels. Yes, much like FPS’ games have been for the last 20 years, this is still pretty much a corridor shooter. However, the fact that getting from the entrance of an area to an exit of the area requires you to dodge some rather strange obstacles, complete jumping puzzles and hunt down different coloured keys, makes this game very old school in design. 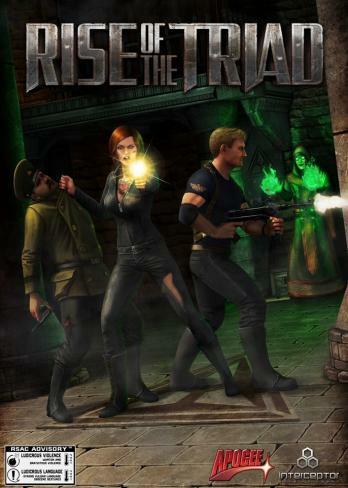 While modern games rely on cinematic action sequences to keep you entertained, Rise of the Triad has you trying to work out a path through a maze of moving razor blades, requiring not only expert timing, but also expert positioning. 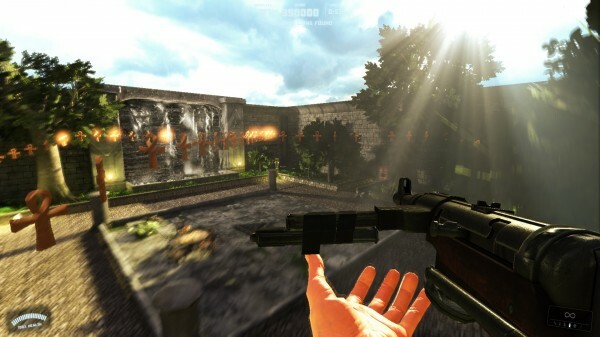 The way weapons are handled in Rise of the Triad is a happy medium between realism and fantasy. What this means is that your loadout is generally dictated by a few simple rules. You can have up to three bullet based weapons (sub-machine gun, dual pistols and a pistol), one explosive weapon and one magical weapon. Interestingly enough, it’s only the bullet based weapons that have unlimited ammo. If the player uses up all of their rockets or magic ammo, they’re forced to lose access to that weapon. However, with rockets and magical weapons, if the player manages to pick up another weapon of that type, they will drop their current weapon and pick up the new one. So if you remember where it is that you drop a weapon, you can always backpedal to it later, although in most cases, this is unnecessary. Remember a time where shooters had massive boss fights that weren’t just inserted to build up play time and were actually difficult and rewarding? Rise of the Triad harkens itself back to a time where these things existed. Even the first boss in this game is amazingly intricate to work out. In the first phase, he’ll shoot these kinds of waves at you, from there it ramps up in difficulty until he’s firing explosives at you, springing firey spikes from the ground and launching fireballs across the ground. Each boss fight in the game has a build up of elements like this boss fight, and each one is rather creative in its execution. My one gripe about this game, really, is that nobody in this country appears to play the multiplayer. Over the course of the week, there was one Australian match happening whilst we were online. And while the multiplayer is incredibly fun, actually finding a game can be a bit tough. On top of all of these elements still is that because this is a Steam game, it has Steam achievements built into it. Unlocking all 111 of these achievements might seem like a difficult task, but they’re really fun to go about doing. It was particularly enjoyable seeing some of the achievements and having a laugh at some of them. They poke fun at the game, the developers and gaming in general. If there was an achievements of the year award, it’d go to Rise of the Triad. 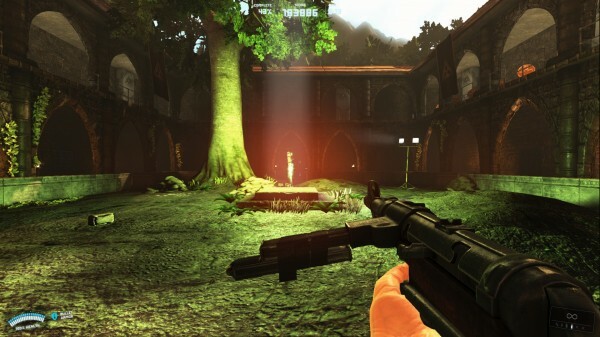 Rise of the Triad is a ball of creativity when it comes to the gameplay. You can tell the developers had a lot of fun recreating this game. This fun is reflected back at the player who will then have fun themselves. Visually speaking, Rise of the Triad seems a bit dated if you’re standing still and not actually playing the game. However, once you start adding in the insane movement speed, the motion blurs and a plethora of gibs. You’ll find the game actually looks really amazing. What’s interesting about the game visually is the way that everything that should be really different blends in together in this world. 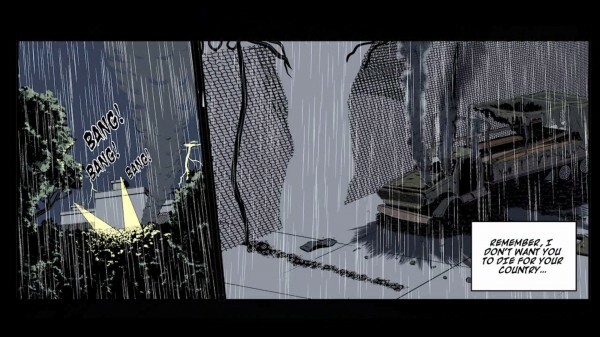 For example, a magical baseball bat seems in no way out of place within a Nazi-esque facility. One thing that was nice to see was how on the games overworld map, there were a lot of homoages to past classics. If you look hard enough, you can even spot mecha-hitler from Wolfenstein 3D. Rise of the Triad has an amazing metal soundtrack that reconstructs the original arrangements from the original Rise of the Triad game. The developers have also included the original soundtrack as well, and that can be toggled on or off in the audio options. Adding to the fun, or sometimes frustration, is the games in-game announcer. You just died? “Get to the chopper… oh wait you can’t”. Die too many times in Multiplayer? Guess what, you’re a “loooosssseerrrrrrr….”. It’s things like this that take Rise of the Triad above and beyond your standard game. It’s a box of fun, and tries to be little else. Do you know the saying: “style over substance”? Well, Rise of the Triad is a game that rises above that saying because this is a game where the style definitely creates the substance. For a remake to have come out so well is nearly unheard of, it just goes to show how passionate and involved the production team were.